1.) Is 32-bit “float” the same as 32-bit recording? 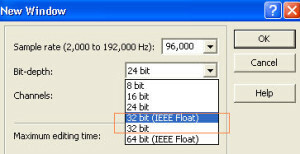 The 32-bit (IEEE float) is the 32-bit float bit depth. 2.) 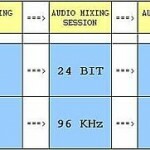 Is 32-bit float in recording software is essentially the same as 24-bit recording? Yes. For example in Adobe Audition, you cannot directly set a 24-bit depth recording. Instead they have a 32-bit float. After converting analog to digital data using your audio interface (for example sound card); Adobe Audition will be storing these recordings in 32-bit float format in your computer hard disk drive but the resolution is still 24-bits. To get the most quality out of your recordings, set your audio interface to record at the highest supported bit depth (which should be 24-bits and NOT 16-bit). As of this time, 32-bit sound cards are not commercially available; however most decent sound cards and audio interfaces now support 24-bit depth resolution during recording. What is a 32-bit floating system and how it works? It consists of a sign (which tells whether the value is negative or positive); an 8-bit exponent and a 23-bit mantissa. 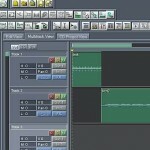 During digital audio processing (effect plug-ins, etc); the recording/mixing software will do intensive and complex numerical calculations internally. 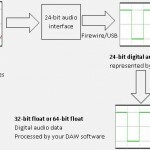 With 32-bit float, the result of calculations during effect processing will not result to truncations or rounding errors of digital data because complex results can be represented by the 32-bit floating binary. 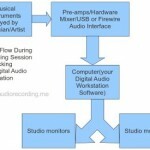 It is the reason why most digital audio workstation software works internally at 32-bit float to get the best quality out of effects processing and mixing. To understand the conversion process between 32-bit float to decimal, download this 32 bit float to decimal Excel calculator. 10111110010110000000000000000000 is equivalent to -0.2109375.